Diversion signs dug into the ground by council workers AFTER plans for a diversion were scrapped will be covered up to avoid confusion, the authority pledged. Shopkeepers in Devonshire Road voiced their concern the signs, which they said were put up earlier this week, will confuse motorists when repair work on the railway bridge starts on Monday. The street was set to be closed to southbound traffic for 15 weeks, but the council announced a U-turn last Thursday after backlash from traders, and said a two-week trial of temporary traffic lights would be carried out instead. But, should the move cause problems, as seen when lights were used during electrification work near the bridge last month, the council will revert to its Plan A. “It seems a bit negative to already have the signs up before it’s even been given a chance. And Julie Buttriss, 47, co-owner of the nearby Number 273 Fishery Fish and Chips, said: “Why have these signs appeared and why have they been fixed in to place? “The council seem to have already decided what they are going to do. A council spokeswoman was unable to say how much fixing the diversion signs into place cost. When asked why they were erected using asphalt, she said: “The reason we have fixed the signs is because the works are planned for approximately 15 weeks. Work to repair Devonshire Road Bridge is due to start Monday, as part of an £11.3m project to upgrade bridges across Blackpool. Supporting steel beams, which have corroded over time, will be replaced, with work set to take 15 weeks to complete. During that time the road, one of the main routes between Blackpool and Bispham, Cleveleys and Fleetwood, was set to be closed to southbound traffic between Claremont Road and Mansfield Road. A diversion was originally proposed along Warbreck Hill Road, Plymouth Road, Poulton Road, Westcliffe Drive and Talbot Road. But after business owners voiced their fear of losing passing trade, plans for a two-week trial of temporary traffic lights have been put in place. What has caused the confusion? The council’s U-turn was announced on social media last week, but The Gazette, which covered the original closure plans, was not directly informed until earlier this week. And shopkeepers, who knew of the change of plans, said they were then left further baffled when workers turned up on Monday to fix diversion signs in place. Speaking previously, Roads boss Coun Fred Jackson said: “When we announced our plans for the repairs to Devonshire Road Bridge we received a lot of comments from ward councillors, residents and businesses, expressing concern about the diversion route. While we think this is the best option to help traffic flow as freely as possible, we are happy to take everyone’s comments on board and trial temporary lights as an alternative. This means, when the work starts on Monday, the road will remain open both ways and the traffic will be managed by temporary lights. Electronic signs warning motorists of the major project have been secured using sandbags and barriers. So what happened last time? In April, temporary traffic lights were put up at the bridge to allow rail contractors to complete work linked to electrification efforts, leading to severe delays. They were removed on the orders of the council, which claimed the lights were put up without permission. One lane was later closed, albeit in an evening outside of peak hours. The road was shut between 8pm and 2am on three days, and 8pm until 11pm on one Sunday, while the work was carried out. Will the lights trial work? Michelle, from Butty Bar, was not convinced, saying: “It might make a bit of a difference, but when they have had temporary traffic lights before it was chaotic. “I think people will just think they will be stuck in a traffic jam and will avoid this area anyway. “Until it happens we don’t know what it will be like but it is definitely going to have some effect. Jo Gillespie, 39, is the manager of florist Flower Scentsations, and said she was also sceptical. “It gets very busy when there is two way traffic,” she said. “There have been temporary traffic lights before and people tend to get very agitated with horns honking and impatient drivers who have several bumps and crashes. “So, although I am willing to give it a try, I am not sure how it is going to work. Susan Calvert, 59, and partner Paul Cross, 44, who own Whirlpool Cleaning Launderette, also in Devonshire Road, said they accept the work has to be done, but said 15 weeks is too long. Caroline Allday, 54, owner of hairdressers Scissor Trix Hair Design, said she is concerned about the plans either way. She said: “At least temporary traffic lights would mean there would be some traffic flowing but I can’t see it being any better. And Barn Hill Farm Meats owner Mark, who declined to give his surname, said he noticed the diversion signs being put in place despite the proposal for the two week trial. 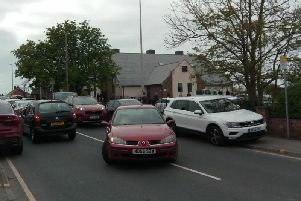 He said: “People will get stuck in traffic and there will be queues backing up. So it just means people will get fed up and go a different way. Steve Barrow, hairdresser at Devon Hair: “Nobody wants it to be done but it has to be so there is no point complaining about it. It will definitely affect trade as we will lose walk in customers as people will just go another way.